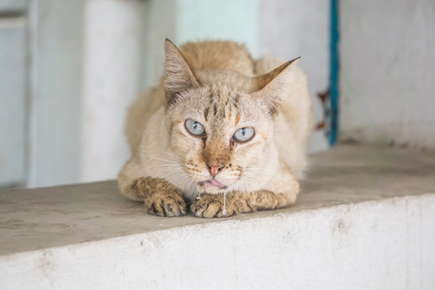 Cats rarely display their pain, but cats with feline stomatitis are often the exception. If your cat appears to have mouth pain, is reluctant to eat, doesn't want to groom, is drooling, and doesn't want you to open its mouth, it may be suffering from this debilitating, degenerative oral condition, and prompt treatment is a must. Stomatitis refers to an inflammation of the oral mucosa, the mucous membranes that line a cat's mouth. This layer of cells can become inflamed for a variety of reasons. The more frequent causes of inflammation are gingivitis and periodontal disease. In the case of stomatitis, the exact cause isn't known, but it is suspected to be an immune-mediated disease. Depending on the extent of lesions, this condition is also called faucitis and caudal mucositis, if the areas in the back of the mouth behind the teeth are affected. Stomatitis affects all breeds of cats, and can occur in any age. Treatment for oral inflammation depends on the severity of the disease. Milder cases can be treated by having a dental prophylaxis under anesthesia. Once the teeth are cleaned, you may be asked to apply a chlorhexidene gel to help keep the bacteria under control. Taking dental X-rays is important in all these cases as a degeneration of the tooth termed resorption, may occur in the crown or root of the tooth. This resorption can cause pain and inflammation. More advanced cases of feline stomatitis generally call for extraction of all or a majority of the affected teeth. While this approach might sound extreme, it can also be highly effective at curing the stomatitis altogether, instead of merely keeping it in check. If extractions of the molars and pre-molars doesn't resolve the problem, further extractions of the canines and incisors very well might. Some cat owners decide to spare their cats a possible future surgery by having these teeth removed with the others. X-rays of the teeth during extraction are critical because any piece of a tooth is left behind, the inflammation will persist. Your cat's stomatitis may also involve the bone surrounding the teeth, leading to a condition called osteomyelitis. This is a serious infection of the bone surrounding the teeth which is treated by removing the diseased bone and then allowing healthy tissue to regenerate in its place. Kirby, Naomi, DVM, MS, "Managing Feline Stomatitis," IVC Journal. Lews, John, VMD, FAVD, DIPL. AVDC., "Why Teeth Removal is Best When Your Patient Has Feline Stomatitis," Veterinary Practice News. Merck Veterinary Manuals, "Oral Inflammatory and Ulcerative Disease in Small Animals." DURING NON-BUSINESS HOURS, FOR EMERGENCIES, PLEASE CALL ORCHARD PARK EMERGENCY CENTER AT 662-6660. THEY ARE ADEQUATELY STAFFED 24 HOURS A DAY FOR URGENT CARE NEEDS. "The people that work here are very caring when it comes to your pets the staff are very well trained in what they do they explain everything you need to know if your pet is ill..."